Lewis Jungle Ministries: A Faith Ministry: We are REALLY on our way!! Just a note to let you know we're on our way! We were delayed a week leaving--waiting to get David Gate's plane, the twin comanche, out of the shop and checked out. Then they decided to replace a governor that was not always working right. During this time, David was encouraging us strongly to look for a plane to buy for our project in Guyana. The Cessna 172 in Venezuela was sold for $50,000 and he wanted us to get a plane bought. So, Gary started looking for a plane. He found a maule and a cessna 182 that were close to the budget. The day we were going to make arrangements to go look and probably buy the 182, someone else bought it. So, on Monday, June 9, Gary and Gary Roberts (the pilot/mechanic from Africa) went to Los Angeles to look at the maule. Gary R., who flew in Guyana many 1000's of hours during the 6 years he was there, felt this would be the perfect plane for us. We were able to borrow the rest of the money owed on the plane. so they bought it and flew it out to Chattanooga, Tennessee. They arrived Thursday afternoon. On Friday and Sunday, Gary R. was able to do most of the annual on it (he will finish it in Guyana), and replace the battery and a do what needed to be done on it. On Sunday afternoon, we packed up the plane with what we could fit in it, within the weight limits. I had opted to fly commercially, so we could take a few more of our things and have a little more room in the plane. 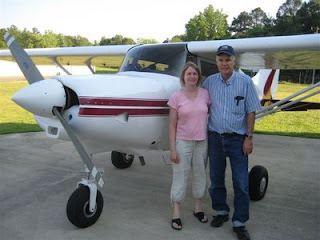 On Monday morning, Gary, Gary & Wendy Roberts and their two kids flew it to Moultrie, GA to get an STC kit put on it to be able to use auto fuel--which will make it cheaper to fly. Monday afternoon, they flew to Orlando, Florida, where they stayed over night. This morning, I got an email from Gary stating they were leaving Orlando this morning and heading for Turks & Caicos Islands tonight; then on to Grenada tomorrow; and should arrive in Georgetown, Guyana on Thursday. I have put in a little map for you to visualize where they are flying. Georgetown, Guyana is right at the top of South America on the coast. My flight will leave early Thursday morning, and I will arrive around 10:30 pm that evening. They should arrive there before me, if the weather isn't a problem. If we hadn't been delayed, we wouldn't have bought this airplane to use down there. We are very thankful that God always has a purpose in His plans--even when we can't see it! We are now embarking on this new faith venture! It is a bit scary, but God has all the resources in the world, and will continue to guide and help us! Thank you so much for your prayers and support! I'm so glad things have worked out. :) It was really good to see you both!